This is very useful, thanks! Would these events have a high overhead for systems with high recompile rates? Collecting the events has little overhead. Especially compared to the cost of frequent recompiles. There’s a lot more overhead because of the extra CPU that is spent in recompiling queries unnecessarily. 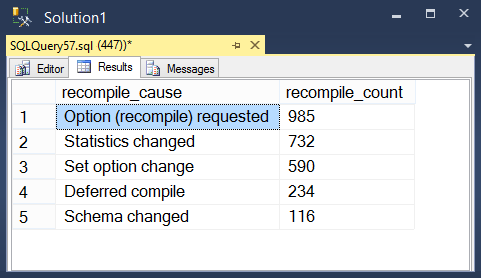 We once made a change which was the equivalent of marking one query as RECOMPILE. And the CPU hit 100% until we undid the change. And we once collected extended events that caused the CPU to hit 100% 🙂 But it’s good to know it shouldn’t happen with these ones.